Add the remaining ingredients and continue to sauté over medium heat for 10-15 minutes. Stir often because brown sugar will burn easily. Once cooked, use a fork to press the remaining larger pieces of jackfruit so that the pieces fall apart and resembled the fibers of cooked pork. At this point, you have two options - first, you can purchase jarred pulled pork sauce at your local grocery store, or second, you can make your own sauce by following these next steps. If you decide to use store-bought sauce, be sure to read the label, not all sauce is vegetarian. In a mixing bowl, whisk together ¼ teaspoon garlic powder, 2 tablespoons olive oil, ½ cup brown sugar, 2 cups ketchup, 1 cup water, ¼ cup soy sauce, ¼ cup vegetarian Worcestershire sauce, ½ teaspoon salt, ½ teaspoon pepper, ¼ teaspoon crushed red pepper flakes. You can add liquid smoke too if you desire. 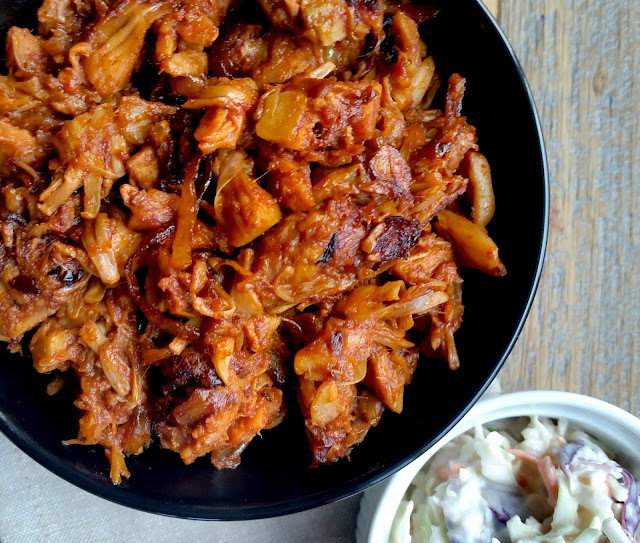 Poor the sauce over the jackfruit, lower the heat to medium-low, and cook for 15 minutes. As a side note, the longer you simmer the mixture, the deeper the flavour will be. Even though this dish is ready in less than 45 minutes, you can leave the "meat" to simmer for a longer period of time to intensify the flavour. If the mixture becomes dry, add 1 tablespoon of water and stir. 0 Response to "Vegetarian Pulled Pork"